The Turkish Republic of Northern Cyprus (TRNC) (Turkish: Kuzey Kıbrıs Türk Cumhuriyeti, KKTC), commonly called Northern Cyprus, is a de facto independent republic, located in the north of Cyprus. The TRNC declared its independence in 1983, nine years after a Greek Cypriot coup attempting to annex the island to Greece triggered a Turkish invasion of Cyprus. It has received diplomatic recognition only from Turkey, on which it is dependent for economic, political and military support. The rest of the international community, including the United Nations and European Union, recognize the sovereignty of the Republic of Cyprus over the whole island. People of TRNC use Yeni Turkish Lira (YTL) as their currency in daily trade, but Euro, Pound Sterling and U.S. Dollar and readily accepted. 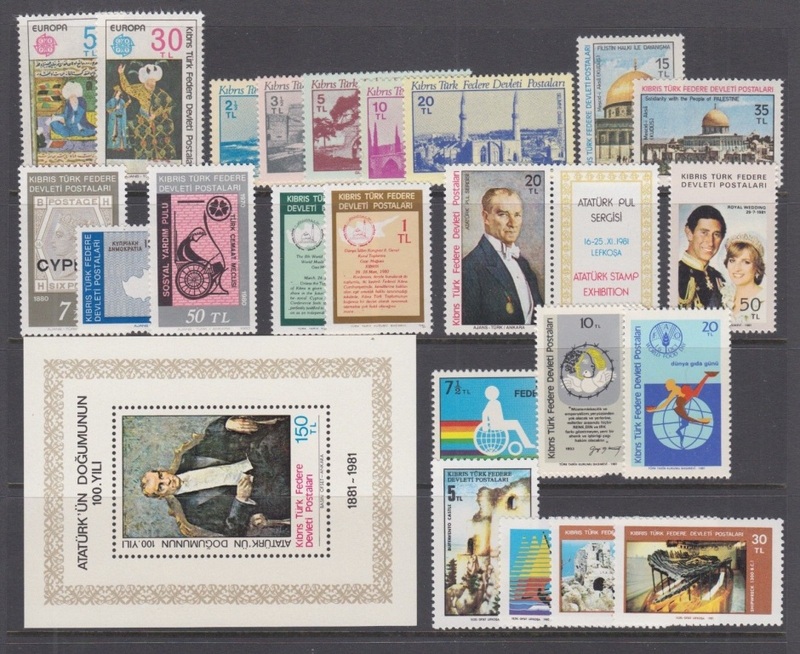 They have their own postage stamps (since 1975) currently with Yeni Turkish Lira (previously: Turkish Lira) denominations. 20 Jul 1974 Turkey invades Cyprus and occupies northern region. 13 Feb 1975 Turkish Federative State of Cyprus. Cyprus. [recognized only by Turkey]. Vice President of Republic of Cyprus from 03 Dec 1959 to 28 Feb 1973. Vice President of Republic of Cyprus from 28 Feb 1973 to 13 Feb 1975. President of Turkish Cypriot Communal Chamber from 29 Dec 1969 to 05 Jul 1976. Prime Minister post has been created since 05 Jul 1976. He was acting till 03 Jun 1975. Prime Minister from 01 Jan 1994 to 16 Aug 1996. Prime Minister from 13 Jan 2004 to 26 Apr 2005. Prime Minister from 19 Jul 1985 to 01 Jan 1994, 16 Aug 1996 to 13 Jan 2004 and 05 May 2009 to 23 Apr 2010. An architect by profession, Akıncı became the first elected mayor of the Nicosia Turkish Municipality in 1976 at the age of 28, defeating a candidate endorsed by President Rauf Denktaş as the candidate of the Communal Liberation Party (TKP). He held this position for an uninterrupted term of 14 years until 1990, leading several projects for the city that won him international awards including the Aga Khan Award for Architecture and collaborating with his Greek Cypriot counterpart. Meanwhile, he rose to prominence and gained influence within his party, first becoming Secretary General and then leader in 1987. He served as a member of the Assembly of the Republic between 1993 and 2009 and as the Deputy Prime Minister and Minister of State between 1999 and 2001. His leadership of the TKP ended in 2001. He established the Peace and Democracy Movement in 2003 and served as its leader. Akıncı is a long-standing advocate of the reunification of Cyprus and has opposed Turkey's increasing influence in Northern Cyprus. Year: ND (1976). Weight: 121.1g. Metal: Brass. Diameter: 64.00 mm. Edge: Plain. Alignment: Medal. Mint: Turkish Mint. Obverse: "KIBRIS TÜRK FEDERE MECLİSİ 1976" (Cyprus Turkish Federated Assembly 1976) written in the center within wreath and having crescent and star above it. "EGEMENLİK ULUSUNDUR" (Sovereignty belongs to the nation) written in circular form outside the wreath. 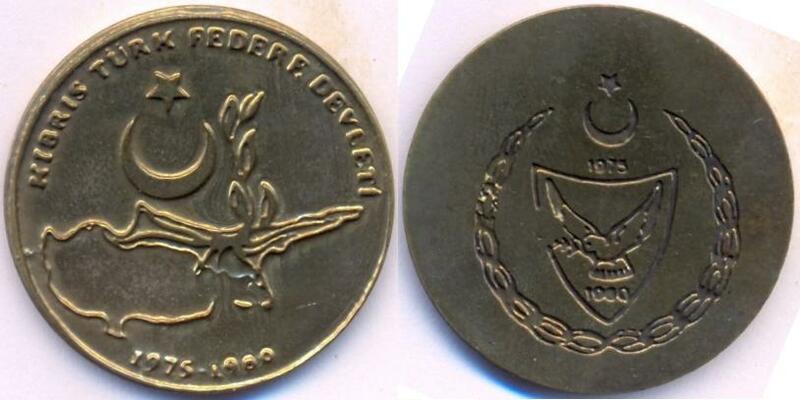 Reverse: "Kıbrıs Türk Federe Meclisinin Saygılarıyla" (Turkish Cypriot Federal Assembly of the Yours) written on the coin with engraved Date: "17.3.1979" at the bottom. Mintage: N/A. Minted Years: One year type. Year: ND (1980). Weight: 13.95g. Metal: Brass. Diameter: 33.50 mm. Edge: Plain. Alignment: Medal. Mint: Turkish Mint. Obverse: "KIBRIS TÜRK FEDERE DEVLETI" (Cyprus Turkish Federated State) written in the top section. A plant growing with root spread on Turkish Republic of Northern Cyprus map only. Dates: "1975-1980" written at the bottom. Reverse: Coats and arms of 1980 in the center. Mintage: N/A. Minted Years: One year type. 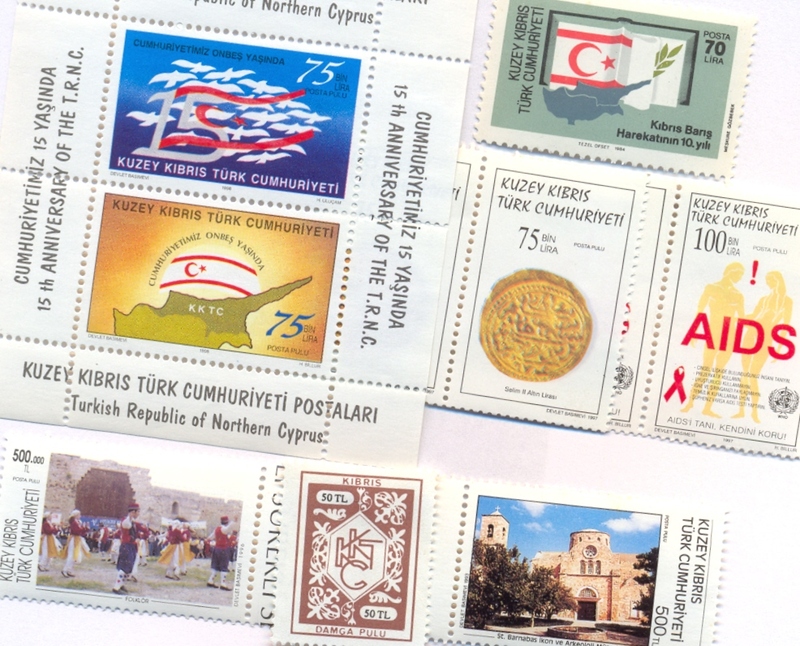 Subject: 5th anniversary of Turkish Federative State of Cyprus 1975-1980. Year: ND (1986). Weight: 116.9g. Metal: Copper, Gold plated. Diameter: 65.50 mm. Edge: Plain. Alignment: Medal. Mint: Turkish Mint. Obverse: 12 various sizes of Turkish Airlines of Northern Cyprus logos within clouds in the center. "KUZEY KIBRIS TÜRK HAVA YOLLARI" (Turkish Airlines of Northern Cyprus) written outside the clouds. dates "1974" written on the bottom left side within cloud and "1986" at the bottom right side within the cloud. Reverse: "KUZEY KIBRIS TÜRK HAVA YOLLARININ KURULUŞUNUN 12. YILI" written with the first four top four lines. The English translation "12.ANNIVERSARY OF THE TURKISH AIRLINES OF NORTHERN CYPRUS" is written within the last four lines. Crossed wreath at the bottom. Mintage: 50. Minted Years: One year type. Weight: 115.3g. Metal: Copper. Mintage: 100. Note: Cyprus Turkish Airlines Limited (Turkish: Kıbrıs Türk Hava Yolları Ltd. Şti. (KTHY)) was a Turkish Cypriot airline that served as the flag carrier for Northern Cyprus, and was based in the Turkish sector of Nicosia. Cyprus Turkish Airlines was also the main airline that flew passengers to Northern Cyprus until its collapse in June 2010. Scheduled flights were operated from Ercan, Northern Cyprus to several cities in Turkey, the United Kingdom and Western / Northern Europe. KTHY had its main base at Ercan Airport situated near Nicosia. The airline was de jure registered as a Turkish company in Istanbul. Cyprus Turkish Airlines was established on 04 December 1974 in Nicosia with shares equally divided between THY and the Cash Development of the Consolidated Fund of the Assembly of the Turkish Cypriot Community (Konsolide Fonu Inkisaf Sandigi). The first scheduled flight was operated on the 03 February 1975. In 2005 the Turkish government sold its shareholding to Ada Havayollari. To avoid bankruptcy due to a $100 million debt, the management had decided to sell the company in June 2010. After the end of the bidding period, the Turkish carrier Atlasjet was the only bidder. On 21 June 2010, the airline announced via their website that they had ceased all operations until further notice and eight days later, on 29 June 2010 it was announced that the airline had gone out of business. It declared bankruptcy on 19 September 2010. A new airline, North Cyprus Airlines is suppose to scheduled flights operating from Ercan International Airport, Northern Cyprus and will fly to an apparent 11 destinations globally, including Turkey and the United Kingdom as well as several other destinations in Western and Northern Europe. Orhan Sivrikaya became the first CEO of North Cyprus Airlines. It was founded in 2011; as of October 2013, the project is frozen. Year: ND (1984). Weight: 23.23g. Metal: 0.925 Silver. Diameter: 38.50 mm. Edge: Plain. Alignment: Medal. Mint: Turkish Mint. Obverse: "K.K.T.C." written at the top section. Celebrating 10 years of Turkish invasion emblem in the center. "20 TEMMUZ" (20 July), "BARIŞ VE ÖZGÜRLÜK BAYRAMI" (Peace and Freedom Festival), "10. YIL" (10 years) and 1974-1984" written within the logo. Reverse: TRNC (KKTC) emblem in the center. "KUZEY KIBRIS TÜRK CUMHURİYETİ" (Turkish Republic of Northern Cyprus) written around it. Mintage: N/A. Minted Years: One year type. Subject: 10th anniversary of Turkish invasion 1974-1984. Note: 10 years of Turkish Invasion on 20 July 1974-1984. This day is celebrated as Barış ve Özgürlük Bayramı (Peace and Freedom Festival). Coats and arms can also be seen on the other side of the coin. The year 1984 also coincides with the 1st anniversary as Republic, claimed on 15th November 1983. If we assume that this coin was created in 1984 and compare it with other Turkish coins created in the same year (.925Ag 23.33g coins of Decade of Woman, Winter Olympics, Summer Olympics, etc), then it should have the same face value of 5000 Lira of that time. Year: ND (1993). Weight: 22.95g. Metal: 0.925 Silver. Diameter: 38.50 mm. Edge: Reeded. Alignment: Medal. Mint: Turkish Mint. Obverse: 10th anniversary of Republic logo in the center. "CUMHURİYETİMİZ ON YAŞINDA" written below it. Reverse: TRNC (KKTC) emblem in the center with "10. YIL" written within it. "KUZEY KIBRIS TÜRK CUMHURİYETİ" (Turkish Republic of Northern Cyprus) written around it. Mintage: N/A. Minted Years: One year type. Subject: 10th anniversary of the Republic 1983-1993. Year: ND (1994). Weight: 22.96g. Metal: 0.925 Silver. Diameter: 38.50 mm. Edge: Reeded. Alignment: Medal. Mint: Turkish Mint. Obverse: TRNC Flag in the center. "BARIŞ VE ÖZGÜRLÜK BAYRAMI" (Peace and Freedom Festival) written around the flag. Dates "1974-1994" written at the bottom. Reverse: TRNC (KKTC) emblem in the center. 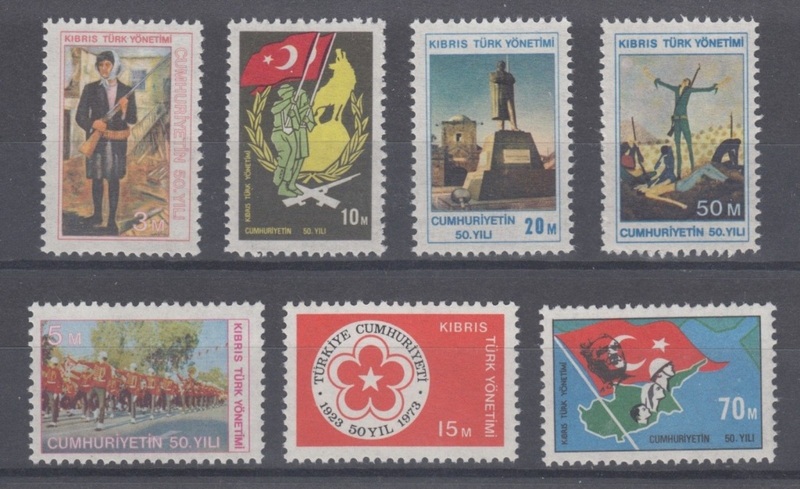 "KUZEY KIBRIS TÜRK CUMHURİYETİ" (Turkish Republic of Northern Cyprus) written around it. Mintage: N/A. Minted Years: One year type. Subject: 20th anniversary of Turkish invasion 1974-1994. Year: 1998. Weight: 23.11g. Metal: 0.925 Silver. Diameter: 38.50 mm. Edge: Reeded. Alignment: Medal. Mint: Turkish Mint. Obverse: TRNC Flag in the center. "CUMHURİYETİMİZİN ONBEŞİNCİ YILI" (Fifteen years of the Republic) written around the flag. Date "1998" written at the bottom. Reverse: TRNC (KKTC) emblem in the center. "KUZEY KIBRIS TÜRK CUMHURİYETİ" (Turkish Republic of Northern Cyprus) written around it. Mintage: N/A. Minted Years: One year type. Subject: 15th anniversary of the Republic 1983-1998. Year: ND (1999). Weight: 31.45g. Metal: 0.925 Silver. Diameter: 38.50 mm. Edge: Reeded. Alignment: Medal. Mint: Turkish Mint. Obverse: Monument in the center. "BARIŞ VE ÖZGÜRLÜK BAYRAMI 20 TEMMUZ 1999" (Peace and Freedom Festival on 20 July 1999) written around the monument. Reverse: TRNC (KKTC) emblem without date in the center. "KUZEY KIBRIS TÜRK CUMHURİYETİ" (Turkish Republic of Northern Cyprus) written around it. Mintage: N/A. Minted Years: One year type. Subject: 25th anniversary of Turkish invasion 1974-1999. K.K.T.C. Türk Alkollü Icki ve Şarap Endüstrisi Limited Şirketi TAŞEL 25. YIL anısı kıbrıs - MAGOSA (1999). [K.K.T.C. Turkish Spirits and Wine Industry Company Limited TAŞEL 25TH ANNIVERSARY - cyprus memories - MAGOSA (1999)]. Weight: 110.00g. Metal: 0.925 Silver. Year: ND (1998). Weight: 7.12g. Metal: 0.9167 Gold. Diameter: 22.00 mm. Edge: Reeded. Alignment: Medal. Mint: Turkish Mint. Obverse: "MUSTAFA KEMAL ATATÜRK" written at the top section. Mustafa Kemal Atatürk protrait in the center. Dates "1881-1938" written at the bottom. Reverse: TRNC (KKTC) emblem in the center. "KUZEY KIBRIS TÜRK CUMHURİYETİ" written around it. Mintage: N/A. Minted Years: One year type. Note: Celebrating 15 YIL (years) of Turkish Republic of Northern Cyprus independence in 1998 and remembering the founder of Turkish Republic: Mustafa Kemal Atatürk 1881-1938. The year 1998 also coincides with 60th death anniversary of Mustafa Kemal Atatürk. If we assume that this coin was created in 1998 and compare it with Turkish 60 Million Lira 1999 coin, 45% drop in gold value during 1997-1998 worldwide and keeping in mind the inflation in Turkey, then it should have the face value of approximately 25 Million Lira of that time. Kuzey Kıbrıs Türk Cumhuriyeti 1 Yil (1983) - 7.20g .9167 Gold (22K) - Mintage: 1,000. Kuzey Kıbrıs Türk Cumhuriyeti 3 Yil (1986) - 7.20g .9167 Gold (22K) - Mintage: 2,000. Kuzey Kıbrıs Türk Cumhuriyeti 5 Yil (1988) - 7.20g .9167 Gold (22K) - Mintage: 1,000. Kuzey Kıbrıs Türk Cumhuriyeti 7 Yil (1990) - 7.20g .9167 Gold (22K) - Mintage: 774. Kuzey Kıbrıs Türk Cumhuriyeti 9 Yil (1992) - 7.20g .9167 Gold (22K) - Mintage: 576. Kuzey Kıbrıs Türk Cumhuriyeti 10 Yil (1993) - 7.20g .9167 Gold (22K) - Mintage: 975. Kuzey Kıbrıs Türk Cumhuriyeti 13 Yil (1996) - 7.20g .9167 Gold (22K) - Mintage: N/A. BARIŞ VE ÖZGÜRLÜK BAYRAMI 25 Yil (1974-1999) - 7.20g .9167 Gold (22K) - Mintage: N/A. Dr. FAZIL KÜÇÜK (1999) - 7.20g .9167 Gold (22K) - Mintage: N/A. TMT 50 Yil (2008) - 7.20g .9167 Gold (22K) - Mintage: N/A. In June 2015, after Mehmet Ali Talat assumed leadership of the CTP, the cabinet under former party leader Özkan Yorgancıoğlu fell. Kalyoncu was tasked with forming the new government. On 9 July 2015, it was announced that the government would be formed with the National Unity Party. He is the current leader of the National Unity Party (UBP). He was formerly the Minister of Foreign Affairs of Turkish Republic of Northern Cyprus. From 23 April to 17 May 2010 he was also Acting Prime Minister. Erhürman finished his secondary education in Türk Maarif Koleji. He was then enrolled to study law at Ankara University in 1988. He received his master's degree and doctorate from Ankara University as well. His 2001 PhD thesis was on the "Non-Juridical Inspection of the Authority and the Ombdusman". Erhürman lectured on public law at the Ankara University, Middle East Technical University and Hacettepe University between 1995 and 2001. He then lectured at the Eastern Mediterranean University from 2001 to 2006, and from 2008 to 2013. Erhürman also lectured at the Near East University between the years of 2006 and 2008. A scholar in public law by profession, he served in the negotiations to solve the Cyprus dispute between 2008 and 2010. He previously worked for the Ministry of Justice of Turkey between 1999 and 2004 and worked for the establishment of the position of ombudsman in Turkey. He is the current leader of Republican Turkish Party. In 2010 Fantasy issue of Turkish Republic of Northern Cyprus coin set were released featuring it's main flora (plants) and fauna (insects and animals). 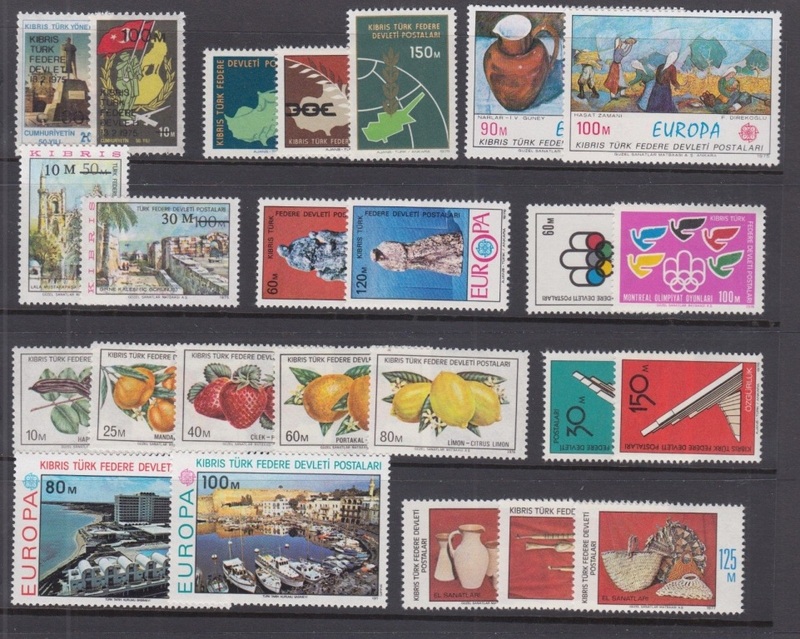 Note: Northern Cyprus used Cyprus Pound =1000 mils on stamps from 1974 to 1977. 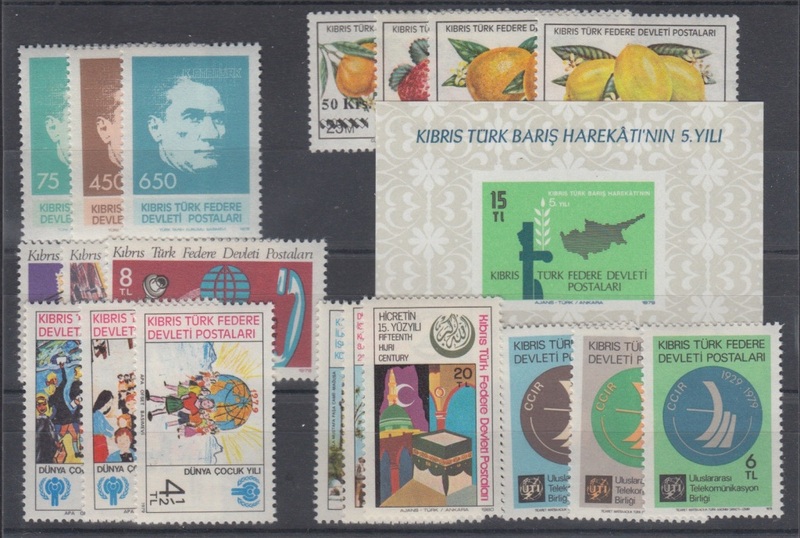 In 1978 the currency was replaced with Turkish Lira = 100 kurus on stamps.